About a year ago now, I participated in the “Give One, Get One” program for the One Laptop Per Child foundation. As part of that, I got one of the little XO laptops. They’re neat little machines, 433MHz processors with 256MB RAM - not a lot of computing power, but fun to play with. I messed around with the Sugar OS for a while, but admittedly got a little tired of it since there’s not a lot you can do in it - it’s an educational item, after all, not a little netbook or something. To that effect, it sat dormant in my office for a few months… until now. I got the urge to get an alternate OS working on there so I could use Firefox and browse the web - actually use it like a mini notebook for light tasks. I found some instructions on the OLPC wiki that explain how to get Ubuntu installed on the XO, but after trying several times, it just wasn’t working for me. I couldn’t get past the step where you set up the Ubuntu image using QEMU. The image would always boot poorly or, in some cases, not at all… and, frankly, while I used to be a Linux guy, my skills in that arena are a bit too rusty to adequately troubleshoot those issues. Plus, the way they explain it, you’re actually putting Ubuntu right on the system - no going back to the original Sugar OS. Thankfully, I found another set of instructions - how to install Ubuntu on an SD card and boot the XO from that. While the setup takes some time, it was super simple and worked like a charm. Plus, it’s non-destructive: if you mess anything up, you can always just remove the SD card and you’re back to Sugar OS. I have my XO booting Ubuntu now and it’s in the process of running system updates. I’m excited to put it back to use! If you have an XO and are interested in getting it running more interesting applications than what’s available on Sugar, try booting Ubuntu from an SD card. It’s worth it. I’m going to post updates to this entry as I get experience with the XO using Ubuntu and include additional things you may want to do, or gotchas you might run into. Make sure to read the comments on that blog article that explains the SD card installation of Ubuntu. There are some things in there that you’ll need to know or might help you out. Check out this wiki entry about customizing Ubuntu on XO. It has a lot of things you might want to do to this base install. Change your hostname. The default hostname for the installation is “OLPC” - a little generic, and if you have more than one at home, problematic. In order to do this, edit your /etc/hostname file to have your new hostname. Also, edit the /etc/hosts file, find the line in there for “OLPC,” and replace “OLPC” with your new hostname. Yes, you have to do it in both places. Reboot and you’re good. Some settings you change won’t persist across reboots. I think this boils down to my not understanding where various settings get updated. For example, the touch pad speed was super slow for me and no matter how many times I changed the setting in the control panel, it wouldn’t persist the setting. Turns out there’s a .xfce4_startup file in the OLPC user’s home directory that specifies the mouse speed - and it overrides any setting you may have put in the control panel. You can change the mouse setting by modifying the xset m 6/10 15 line to be something more appropriate. According to the wiki entry, this will differ based on your firmware verson. For me, xset m 5 12 seems to work really well. I assume you could just remove the line and have it fall back to use the settings from the control panel… but I didn’t try it. Was messing about on the computer this morning when I noticed that Vista thinks I’m not connected to the Internet, even though I am. The “Network and Sharing Center” says I have “Local Only” access right now… but I can get to sites on the Internet, so obviously that’s very wrong. As it turns out, this is a known issue for Vista and Windows 2008 computer that have more than one network adapter. My computer has a wireless and a wired adapter, so I guess I qualify. I found a little additional discussion (not much) in a forum thread. Not sure why it just started doing this today; it was working fine before. No network changes have happened… except I had to reboot my router yesterday. I wonder if that’s what started it. Maybe another router reboot is in order. I got my Ion Drum Rocker drum set delivered yesterday and set it up last night. 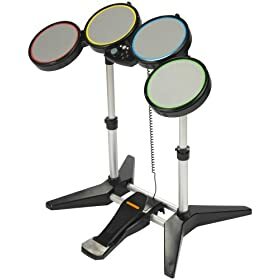 It occurred to me after I’d played with it for a while in Rock Band 2 that I’d finally gotten a chance to play with all of the various gaming drum kits - the Ion, the standard Rock Band, and the Guitar Hero World Tour - and I should probably post a decent comparison since I’d not seen such a thing out there. I was in drama in high school, not band, and I have no musical training. I primarily play Xbox 360, though my GHWT experience was on the Wii. I like the Rock Band game more than GHWT. The set list is better and I have a lot invested in downloadable content. I generally play on the “Hard” difficulty, though I’ll fall back to “Medium” if the song’s really difficult on drums. I’m not awesome by any means, but I can hold my own. The whole reason I started seriously looking at the Ion kit was that I put a hole through the yellow pad in my original Rock Band kit. Portability on the kit is good - you can pick it up with one hand and move it around, and it easily disassembles to go in your car when you need to take it to a friend’s house. This is good for putting it in the other room when you’re done playing so your living room doesn’t look like a studio. The kick pedal doesn’t move around because it’s latched to a bar on the bottom of the kit. The downside of this is that if it’s not well positioned, you don’t get much flexibility on how it gets placed. You eventually get used to it, though. I didn’t have any of the problems with the pedal breaking like I heard some other folks having. The pads on the GHWT kit don’t have any real moving pieces the way the Rock Band kit does. The Rock Band pads sort of “float” and when you hit them the pad depresses, touches a sensor, and the hit is registered. The GHWTpads seem to be pressure sensitive in-and-of-themselves, so it’s a bit more like a real electronic drum kit. There’s also a little more rebound to them, which is nice. The kick pedal on the GHWTkit felt much flimsier than the one on the Rock Band kit. Also, there was really nothing tethering it to the ground so it traveled all over the place while playing and I was very frustrated by having to reach down between songs and constantly reposition it. The big/obvious addition here is that of the cymbals. Rather than leave the hi-hat as a pad even with the rest of the drums, it’s raised up, closer to the way it’d be in a real drum set. It changes the way you play and it takes some getting used to if you’re used to the standard Rock Band kit. Once you get the hang of it, it feels pretty natural and it’s nice. 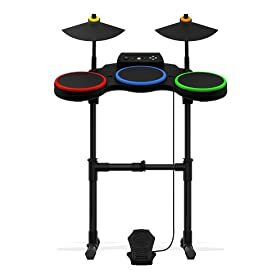 I didn’t get a chance to play Rock Band with this kit so I don’t know how Rock Band handles the fact that this kit has five pads (three drums, two cymbals) instead of the four that Rock Band expects. I assume that you just don’t use the cymbal on the right when you’re in Rock Band. By all accounts the GHWTkit is compatible with Rock Band (and vice versa) so it deals with it somehow. This thing is, by all accounts, the mother of all gaming drum sets. It’s basically a real electronic drum kit that just has a control box that allows it to interface with your system (in my case, Xbox 360). 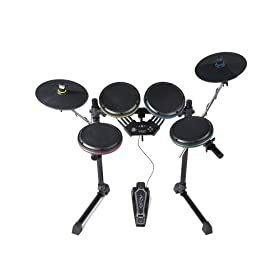 In fact, you have the option to buy a different control box to swap in and allow you to actually play it like electronic drums - outside of the game - so, for all intents and purposes, you’re buying a real instrument. Setup is tricky, as you’ll read about on the web, but not difficult, just time consuming. Part of the benefit of the kit is its flexible setup: you can position any of the pads in pretty much any position you want to customize the experience to your needs. That’s actually kind of its downside, too, if you’re not an experienced drummer because you spend a lot of the first few hours of play fiddling with drum and cymbal positioning in an effort to get it “just right.” All of it is hand-tightened, though, so it’s easy to pretty quickly get things moved around as you need. I’m trying to get my kit set up as if it were a real kit, which is made that much more difficult because I don’t have any background and most stuff on the web just says “make sure it works for you.” That doesn’t tell me much. That said, there are several YouTube videos from helpful folks that tell you things to consider as you set up real kits that I’ll probably take advantage of. For example, I found a good high-level one explaining cymbal placement. The pads are quiet - a bit quieter than GHWT, even. They also have a nicer bounce to them and, much as it may or may not matter, a nicer surface texture. The drums and cymbals feel far sturdier than either the Rock Band or GHWTkits (as well they should) and definitely seem to be built to take a pounding. I’m not going to be putting a stick through the tops of these any time soon. Portability is far lower than the other two kits because this thing is so frickin’ big. The pads are bigger, the cymbals are bigger, and when you get it all configured, you’ll find things are spread out a little more than on the smaller kits. It’s also much heavier (somewhere around 30 - 40 pounds) so you won’t be one-handing this one into the other room like you did with the other kits. You also probably won’t be trucking it to your friend’s house unless you want to spend the time disassembling, reassembling, and reconfiguring the kit. They say it “folds up for storage” and you probably could… if you don’t mind re-setting it up to your liking every time. With this kit, even in the short time I’ve played with it, I can already tell that when I miss a note, it’s my fault. Every time I miss, I instantly already know what I was doing wrong. In the few hours I played, never once did I feel like it ever dropped a note. Something I’m quickly finding out: I am going to have to re-learn how to play. I’ve gotten so used to the tight setup of the smaller kits (and the lack of cymbals) that now I’ve got a better kit I’m actually doing worse because I have to adjust my internal timings - how far it is from one pad to another, stop using the yellow pad for the hi hat and use the actual yellow cymbal, stop using the green pad for the crash and actually use the green cymbal, etc. Not a bad thing, but something to get used to. I like, in order of best kit to worst kit: Ion, GHWT, Rock Band. If you have the choice (and the $300 to spend), go for the Ion. It is, without a doubt, the superior drumming experience. Especially if you primarily play the drums in the game. If you don’t have the choice but can afford to get the whole GHWT band set (again, at the time of this writing, they don’t sell the kit by itself), do that. Even the whole band kit is only $180 or something, which will save you some cash and get you yet another plastic guitar. If you’re really going budget, the Rock Band 2 kit sells standalone for $50. It’s not great, but it works.